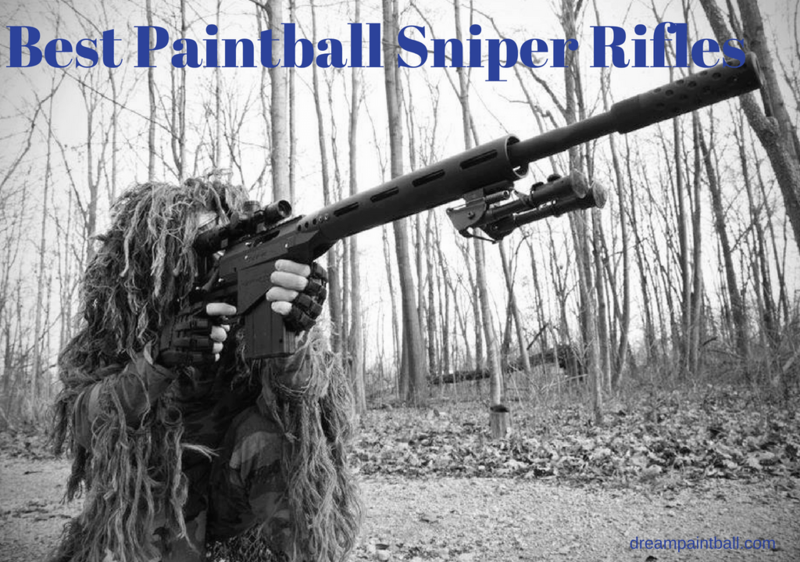 Are you looking for the best paintball sniper guns? Well, you are in the right place. I played paintball for more than 8 years and have used many paintball rifles during my career. 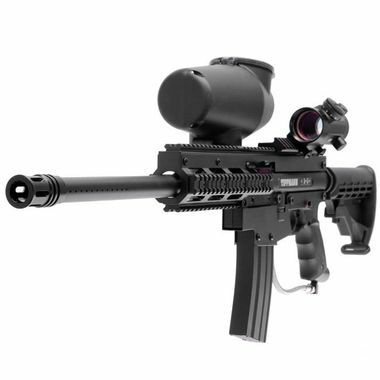 With my experience as a paintball sniper, I would like to help you to choose the best paintball sniper rifle for you. I prepared a list of the 6 best sniper rifles in 2019. Here is the list of top 6 best paintball sniper rifles in 2019. Carmatech SAR12Cis a magazine-fed only platform. It does not take a hopper and it is a bolt-action in which there is a very few paintball bolt-action rifles out there in the market. This is the SAR12C which is the compact version. If you look at it this doesn’t exactly look compact but basically this whole thing tears down and fits into a small backpack. Also, Carmatech SAR12C is first strike compatible. Because it’s a big sweet sniper rifle so I would want to use the first strikes. Well, they do make a kit for it that can convert it to a semi-auto. I don’t know why you’d really want that as we’ve got tons of options out there for semi-auto rifles but like for a bolt-action you have almost no options and nothing that looks like this. Interestingly it’s not as heavy as it looks so you’re not going to have a hard time kind of dealing with this huge beast. With those killer look it would definitely give you a feeling of a real sniper. Overall, it is a little expensive but good value for money. It does come with two 12-round magazines and a 13 ci tank so that’s neat. The barrel is 20 inches Autococker threaded and rifled hammerhead barrel. This is of course first strike compatible which is great for such big snipers. Amazing looks with the lightweight design. Tippmann A5 Sniper Paintball Gun blends the idea of accuracy, precision, and long-lasting features to earn its big name in the wider paintball market. The main idea behind Tippmann A-5 sniper paintball gun is its immense speed that is made possible by a cyclone feed system. It is widely known in the paintball market but with an exemplary accuracy. The features are enhanced and are accompanied by details which are friendly to the user. Tippmann A5 Sniper Paintball Rifle is convenient and easy to use in terms of assembling and reassembling. This is beside the ability to strip the frame off when it comes to storage. The paintball gun is made from a sturdy material which enables it to take impacts of larger magnitude and last long as well. The cyclone feed system for increasing the speed of the gun by connecting the air mechanism to the feeder sprocket. This is also enhanced by the semi-automatic system that ensures the gun fires as fast as the trigger is operated. The gun comes with a gun cocking knob that can achieve a receiver that is fully enclosed capable of firing 500 shots. The maximum feeding rate of this gun is 17 balls per second. For a stable use of the gun, there is a vertical front grip. It also comes with additional features of a 16-inch barrel wrapped in a plastic case and a red dot that ensures accurate precision. This US Army Project Salvo Paintball Marker Gun 3Skull Sniper Set comes fully loaded for action. It contains a twenty-inch tactical barrel that works to your advantage in cases of sneaky hidden shots. For accurate aim and precision, a bipod that can be folded provides a well-balanced and steady rest of the gun for firing. For the acquisition of a clear target, the gun comes with 30mm red dot sight that is adjustable. This allows the use of the red dot over the marker body in a way that minimizes interference through the folding and collapsing of stock. The red dot sight is perfect for the location of the target and accuracy of the shot. A sling comes with this gun which enables the user to pack up when the hikes become unnecessary. It contains a lengthy tactical barrel that is perfect for aims especially on the bipod for that accurate precision. The bipod can also be folded to avoid that extra force. 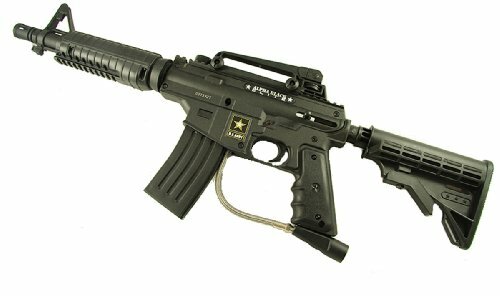 This US army alpha black tactical gun offers diverse features in an affordable make. It is characterized by durability and reliability in an incorporation upgraded features. This sniper paintball gun includes a collapsible stock of style M16 six. It resembles a realistic military look with an 11-inch barrel that includes an integrated handle and a removable magazine that can act as a toolkit. It works magnificently with the in-line bolt system, a cast receiver that is completely made of iron, a feeder elbow that is quick to receive as well as a stainless steel gas line. 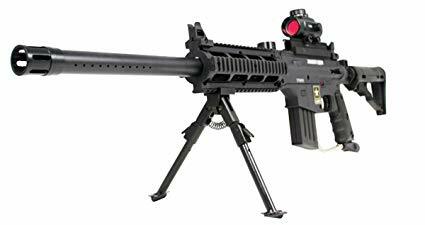 The almost 12 pounds package of this tactical gun includes all the necessities needed to play paintball and manufactured by a Tippman US army which terms as a reliable dealer. It is a super reliable gun. US Army Alpha Black Tactical Sniper comes with a lengthy barrel, foldable handle, as well as removable magazine. 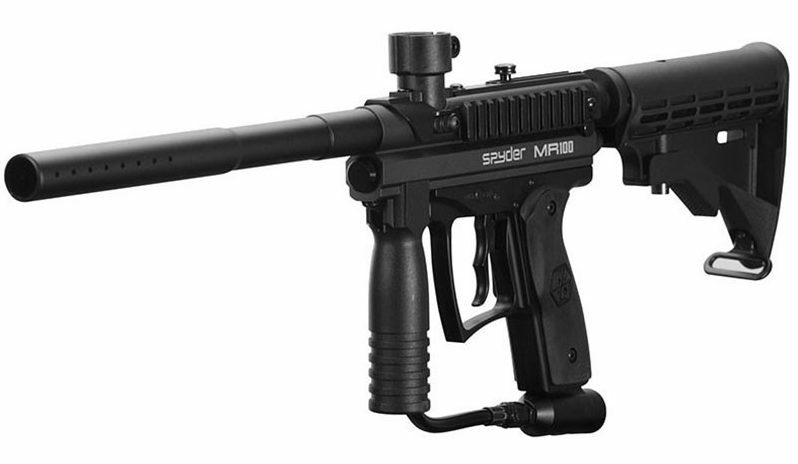 The Spyder MR100 pro sniper paintball gun is the ultimate game enhancer. With the ability to shoot 1600 shots from a 20 Oz CO2 tank using the air efficient Eko valve system this would be a perfect sniper for you. The stability of the mounting system has been enhanced by the clamping feed neck and a multiple sided Picatinny rail. With these features, transportation is easier given the addition of an adjustable car shoulder strap. The package comes with the inclusion of the mask with visor and an anti-fog lens. There is also an empty 20 Oz carbon dioxide tank, black hopper 6+1 deluxe paint-ball harness black 6, one hundred and forty round heavy duty paint-ball as well as transparent tubes and 10z of gold cup oil. It is designed in a military style with the inclusion of an Eko valve system that boasts of capabilities to shoot up to 1500 shots given a 20 Oz carbon dioxide tank. It includes a clamping feed neck of high impact polymer. One ounce of gold cup oil and a 21-inch orange jerk squeegee are some of the accompaniments for its maintenance. The feature of the two-finger trigger mate is also included with anodized finish. The aluminum sides of Picatinny rail make up the mounting. Wrek Paintball Project Salvo Sniper paintball gun is armed with a j8d ceramic barrel of 16 inches length with a smooth and attractive inner surface. This reduces noise and increases accuracy. The inclusion of a raiser rail makes the use of optics even easier. Furthermore, its durability is enhanced by the metal body. The style of a large tube that has been used with red dot sight enhances the field of focus when searching for the target. Finally, there is an inclusion of a bipod that is made of metal. The legs of the bipod can be extended for the stability during the shooting in any scenarios. Comes with a barrel that has been upgraded for high performance. A well-designed style of a large red dot sight. A bipod that is made of metal and capable of extending. Well, these were the top 6 paintball sniper guns or rifles in 2019. All 6 paintball guns are selected by me after research and with my own experience with plenty of paintball sniper rifles. I think these 6 paintball guns are really great and they would definitely help you to enhance your shooting skills as a paintball sniper. Hope you enjoyed reading this article on the top-rated paintball sniper rifles. If you have any questions regarding any of the paintball sniper gun or any suggestion, feel free to comment down in the comment box. I would love to answer your questions and read your suggestions.